It appears I’ll be in San Francisco in a few weeks for Gartner’s Symposium/ITxpo 2005, along with Eric Schmidt and, hopefully, a few of you. Are any of my readers going to be there? Or any bloggers at all? I’ll be the only person attending from my firm. CNet: After looking around, Microsoft decides to expand at home. That the travel across the 520 bridge to get to hypothetical Seattle offices should be viewed as an insurmountable obstacle to development should surprise no one. Microsoft doesn’t know how to build software (broad generalization) unless all the people are within two minutes’ walk of each other. For all its high-techness, the most surprising thing about the Microsoft culture is how meeting-centric it is. The thing that caught my eye was this sentence in the third paragraph: “The company also plans to demolish and rebuild 600,000 square feet of older buildings that lack the power and cooling capacity needed for modern computer equipment.” I wonder if that means a final sayonara for buildings 1 through 6? 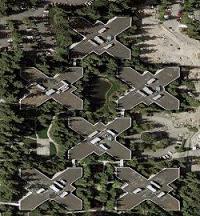 These were the original Microsoft buildings on the Redmond campus, and while they’re earthquake damaged, mold infested, and confusing as hell (check out the satellite photo here and then imagine navigating around the corridors inside those Xs), they’s historic. They also fit sympathetically into the wooded ravine landscape in a way that none of the later buildings manage. Maybe one of my Microsoftie friends can comment on this?